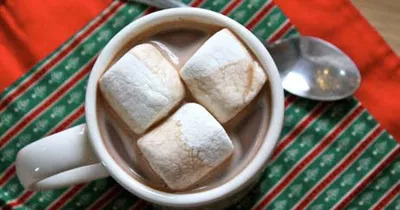 As the temperature drops and snowflakes begin to fall, there's just no better way to warm up than with a piping hot mug of cocoa! The only problem is that the calories, fat, and sugar can add up quickly if you're not careful! An extra tablespoon of chocolate syrup, a swirl (or two or three!) of whipped cream, a drizzle of chocolate over the top—all of these seemingly harmless add-ons can amount to a less-than-stellar nutritional profile. That's exactly why I worked hard to create a delicious and good-for-you hot cocoa recipe. I began with this Gingerbread Hot Chocolate recipe and, once done, had a drink you and your whole family can sip guilt-free this winter! Follow the below substitutions for a drink that is full of muscle-building protein and heart-healthy antioxidants! The above substitutions yielded great results! The beverage had a rich chocolate taste without overpowering the ginger, and the soymilk kept the consistency just as thick as the whole milk would have. A definite must-try for your next cold day! There's a New Gluten-Free Girl Scout Cookie—but Is It Really Any Healthier?